So, here in this age of “swamp draining” and governmental “deconstruction,” we give you a case study on why sometimes our government isn’t all bad. 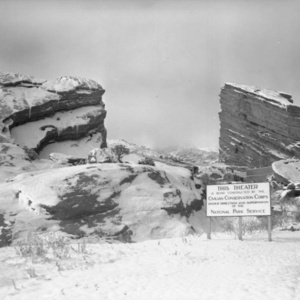 The absolutely breathtaking Red Rocks was, in fact, a government project, constructed by the Civilian Conservation Corps and Works Progress Administration during the New Deal. While Mother Nature did most of the heavy lifting in creating a natural amphitheatre, it took tons of concrete, thousands of man hours, and yes, the freaking United States government, to turn it into the finest concert venue in the United States, nay, the world. Since 1991, Widespread Panic has been tearing it up in the village (dare we say, “our kind of little village?”) of Morrison, Colorado, playing classic tunes for the first time, dropping rarities, and bringing some of their favorite musicians and best friends on stage. This episode starts off in July 1993, the second of two consecutive HORDE shows that summer and jumps to May 1996 for Panic’s first headlining gig at Red Rocks with the boys hitting their stride at the start of the second set. We jump ahead to 1997 for a fantastic four song run from the opening night, and the highly underrated Holden > Last Straw combo. We close out this episode with a couple of selections from June 1998, just a few days before the band headed back to Europe for a few festival gigs. Enjoy!